Even in a cyclical industry, Marathon keeps throwing off gobs of cash that management is returning to shareholders in a big way. One industry that Wall Street doesn't seem to appreciate much is oil refining, even though companies in this business had a great 2017. 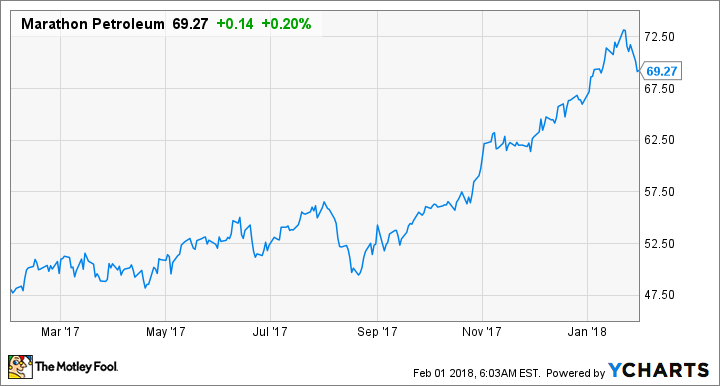 Looking at Marathon Petroleum's (NYSE:MPC) most recent earnings report, it's a wonder why more investors aren't looking at this company as both a value investment and potentially a high-yield dividend. Let's look at what Marathon accomplished this past quarter that makes this stock look attractive now and what 2018 could have in store. Data source: Marathon Petroleum earnings release. EPS = earnings per share. Marathon was yet another company on the long list of businesses that have reported wild swings in net income as a result in the changes to the U.S. tax code. In Marathon's case, the company had a one-time benefit of $1.5 billion as it lowered its deferred tax assets. This resulted in a $3.04 per share gain this past quarter, so the fourth quarter's adjusted result was around $1.05 per share. From an operations standpoint, this was a good quarter overall. Refining margins slipped slightly from $14.14 per barrel in the prior quarter to $13.12 per barrel, but that is largely out of the company's control. What is important is that the company was able to maintain low operating costs -- $7.21 per barrel across all of its regions -- and maintain a high utilization rate -- 101% of nameplate capacity. Marathon cannot do this every quarter because there are seasonal changes to operations and occasional downtime for scheduled maintenance, but this is two quarters in a row of high utilization and cost-efficient operations. That's what investors should care about more than anything else. There wasn't much change for Marathon's Speedway of Midstream segments, but both of them posted respectable results. Next quarter, we are likely to see a significant change to the company's midstream segment reporting. At the end of last year, Marathon announced a dropdown transaction with its subsidiary master limited partnership MPLX (NYSE:MPLX) worth $8.1 billion. The deal, which closed the day earnings were released, included a dropdown of assets that generate about $1 billion in annual EBITDA as well as an exchange of its general partnership stake for limited partner units. Management has been saying for some time that it was intending to do this, so it shouldn't be too much of a surprise to investors who have followed this stock. At the end of the quarter, Marathon reported having $3 billion in cash on hand and $12.9 billion in consolidated debt, $6.9 billion of which is MPLX's. Perhaps the thing that is so miraculous about all of that cash on hand is that the company has spent a lot of money on dividends and share repurchases. In 2017 alone, the company spent over $3 billion on dividends and buying back stock, and yet the company still has all that extra cash lying around. That bodes well for investors in 2018 as capital spending for refining and Speedway are modest, while spending at MPLX will be 60% of the consolidated company's 2018 capex. Looking forward, we believe the global and U.S. macro picture remains solid and expect that good underlying economic growth will continue to support strong demand for our products. Export markets, which have been important to the high utilization of our refineries, are also expected to remain robust. Recent tax legislation complements our outlook and stimulates further investment in the business. As the nation's second-largest refiner, the sponsor of one of the largest diversified master limited partnerships in MPLX, and an industry leader in retail through our Speedway business, we are uniquely positioned to deliver compelling and sustainable returns for our investors. This quarter's tax gain was a nice thing to see on paper, but these changes to U.S. taxes will have a profound impact on Marathon and other refiners as it is a high cash tax business. One has to imagine that these tax changes influenced management's decision to increase its dividend by 15% to a certain degree. Also, chances are the company will continue to buy back loads of its own stock. Despite the ups and downs of the refining industry, Marathon Petroleum continues to deliver outstanding results and an incredibly shareholder-friendly dividend and share repurchase program. As long as management can continue to do this, Marathon looks like a great investment.